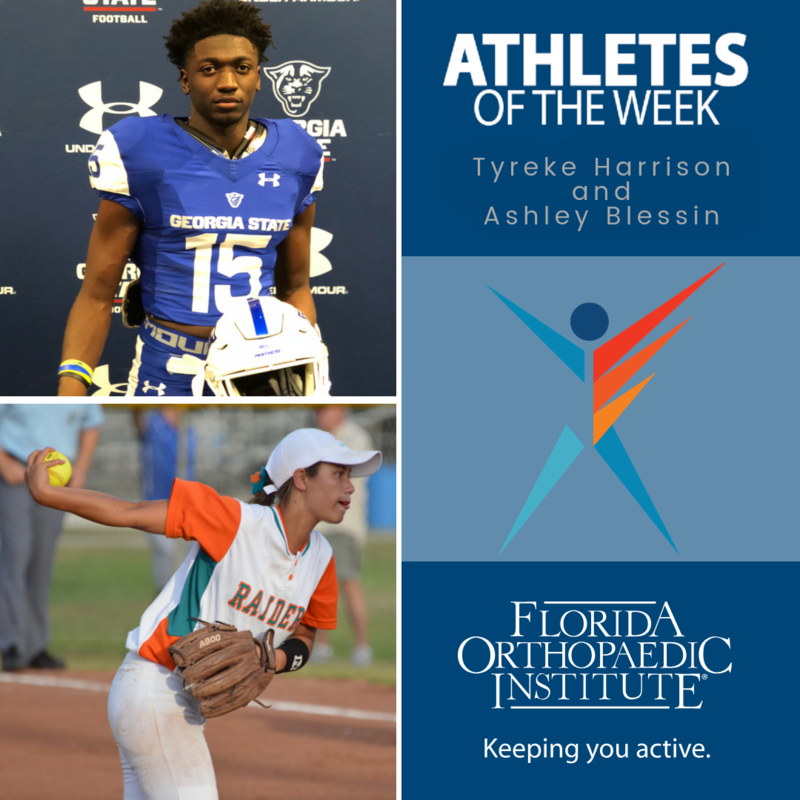 Tyreke Harrison and Ashley Blessin were nominated by the Plant City High School Athletic Director and Head Softball Coach to be recognized by Florida Orthopaedic Institute’s (FOI) Athlete of the Week program for demonstrating extraordinary leadership and team playing qualities on and off the field. Both senior students have won the Athlete of the Week award for the week ending November 30, 2018. Harrison is a senior football captain and track athlete who is focused on getting physically and academically prepared for college this year. Tim Leeseberg, Athletic Director of Plant City High School had high praise for Harrison. “Don’t try and make a decision to make others smile or look at you differently. Make a decision that is best for you because only you know what truly feels right,” Harrison advised to other student-athletes. Blessin is a softball player whose athletic goals this year include going back to the State Tournament and winning districts for her 4th year in a row and Plant City’s 5th year in a row. On a personal level, her goal is to get stronger in order to pitch as a freshman in college. Ashley Bullion, Head Softball Coach and Physical Education Department Head for Plant City High School, recognized her hard work and impressive leadership. “Ashley Blessin is a three-time Hillsborough County Pitcher of the Year. As she enters her Senior year, she holds the all-time school record for most wins, lowest ERA, and will break the strikeout record at some point during her Senior year. She led the Raiders to their first-ever state appearance as a sophomore. Ashley also excels in the classroom with a 5.7 GPA. She is a member of the National Honor Society and Interact Club. Ashley spends time volunteering at the Plant City Food Bank, and also continues to work with young kids at Plant City and Bloomingdale Little League. When she is not playing softball, you will find her umpiring or giving pitching lessons to young girls. Ashley will be attending Marshall University in 2019 on a softball scholarship,” Bullion stated. “I’ve learned that if you want to pitch at a high level, you must love the game of softball and be willing to make sacrifices and work hard to accomplish your goals. I’ve missed doing things with my friends or going to the beach because I’ve had a tournament or softball practice. While I missed that, I love softball as it has helped me to reach my goal of playing at the college level,” says Blessin. Team Player: Athletes who are nominated for excellence in team play are chosen by a coach who feels the athlete does his or her best to put direction into action, make a significant contribution to the team and continuously works to improve his or her skills, attitude and training. Leadership: Athletes who earn the award in recognition of excellent leadership must exemplify strong relationship building skills, show excellent initiative and serve as role models for his or her peers. For an archive of previous award winners, please follow this link. Founded in 1989, Florida Orthopaedic Institute is Florida’s largest orthopedic group and provides expertise and treatment of orthopedic-related injuries and conditions, including adult reconstruction and arthritis, chiropractic services, foot and ankle, general orthopedics, hand and wrist, interventional spine, musculoskeletal oncology, orthopedic trauma, physical medicine and rehabilitation, physical and occupational therapy, sports medicine, shoulder and elbow, spine and chiropractic services, among others. The organization treats patients throughout its surgery centers in North Tampa and Citrus Park, two orthopaedic urgent care centers in South Tampa and Brandon, and 10 office locations in Bloomingdale, Brandon, Brooksville, Citrus Park, North Tampa, Northdale, Palm Harbor, South Tampa, Sun City Center and Wesley Chapel. For more information, please visit: FloridaOrtho.com and ‘like’ us on Facebook: facebook.com/Florida.Orthopaedic.Institute.